Kasich says "There's a new sheriff in town"
…”We’re going to be looking at the program and making sure it is the right size and trying to review it from the viewpoint of safety, economic development and, of course, congestion relief,” Wray said. …After retiring from ODOT in 1999, Wray became vice president of Flexible Pavements of Ohio, an asphalt industry lobbying association. ....the funds in question are not state funds – they are federal pass-through funds, most likely Federal Highway Administration dollars such as Surface Transportation Program (STP) and Congestion Mitigation Air Quality (CMAQ) funds administered by ODOT. Under federal law, these funds must pay for transportation projects or transportation programs only. They cannot be used for education, health care, prisons or other programs unrelated to transportation. 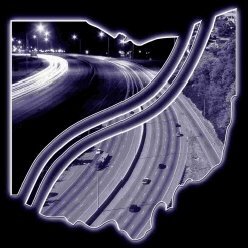 Funding applications to ODOT’s Transportation Review Advisory Council (TRAC) are ranked using a scoring process by whether a project will achieve a more balanced and integrated multi-modal transportation system, embrace environmental stewardship, promote community economic growth and development, and leverage state transportation investment. These goals are aligned with federal transportation investment programs. All Aboard Ohio and the Ohio Environmental Council believe that a project may not be denied these funds if the project has met all existing scoring criteria established by and if there are sufficient federal funds available. Ohio receives about $50 million in federal CMAQ funds each year and many times more in STP funds. The streetcar is seeking $36.8 million in new federal funding. The first phase of the $129.8 million Cincinnati streetcar earned the highest score (84) of any transportation project, existing or new, anywhere in Ohio being considered by the TRAC (100 is the highest possible score). The second phase, extending the streetcar to the Uptown area for $58.6 million, achieved a very high score of 71.5. The streetcar will be powered by electricity – a clean, affordable and domestically produced energy source. “Why is our governor against redeveloping Cincinnati’s downtown and Over-the-Rhine areas with the streetcar? 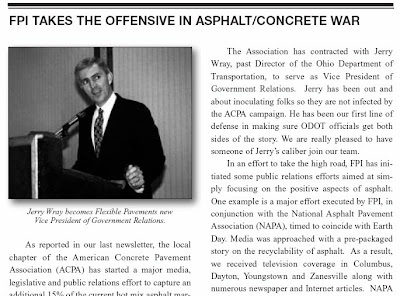 Steel rails offer a far superior path to jobs and growth and clean air than yet another asphalt road pitted with potholes,” said Jack Shaner, deputy director of the Ohio Environmental Council. By comparison, Ohio’s half of the $2 billion Brent Spence Bridge achieved a TRAC score of only 44. And the three components of the $632.2 million project to convert State Route 32 into an expressway in Greater Cincinnati's Eastern Corridor achieved scores of only 34, 39 and 48 (SOURCE). Two studies estimate that the streetcar will stimulate new Downtown/Over-The-Rhine development worth $1.5 billion, or roughly 15 times the cost of the streetcar. ...TRAC last December recommended awarding $36.8 million of ODOT’s share of federal funds to two phases of the streetcar project. The first phase is slated to receive $35 million of the state’s allocation of federal funding in 2012, on top of $15 million already awarded for 2011. The Uptown phase was recommended to receive $1.8 million. The urban landscape of Cincinnati would be very different without Union Terminal and the railroads – especially Over-the-Rhine and the West End. 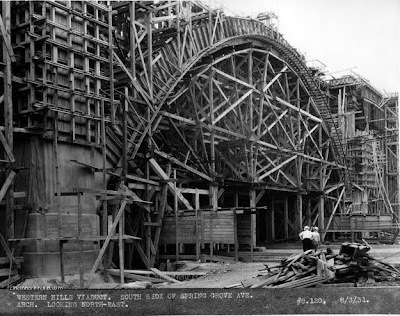 Construction of Cincinnati Union Terminal wasn’t confined to the building itself, or even the rail yard and its buildings – the project encompassed sites from the Western Hills Viaduct all the way down to the river. For a long time, Union Terminal was the ‘front door’ to the city: walk out into the sunlight, and you’re looking right at downtown. That’s a world of difference from the airport, which drops you off in suburbia (and could be AnyCity, USA). Anyone who’s familiar at all with Cincinnati (and Cincinnatians) knows that people just don’t leave, or if they do, they almost always come back! So, the history of Cincinnati Union Terminal – and the development of the city as a result – is really a family history. 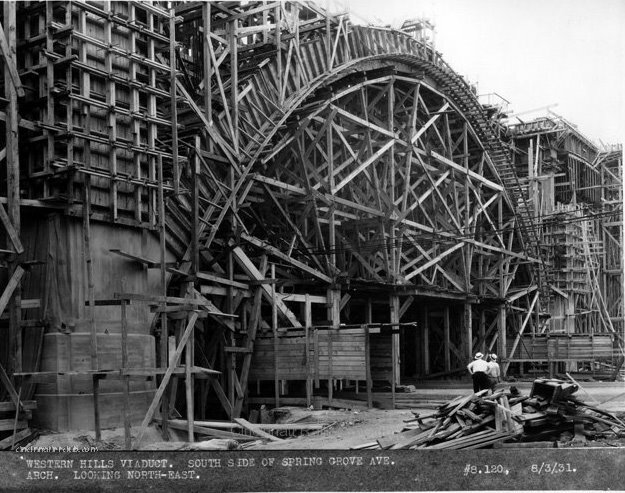 It’s our grandparents and great-grandparents who worked on building and running Union Terminal. It was our relatives who were trackside at the Concourse in its heyday during and after WWII. The Cincinnati Railroad Club has been there almost since the beginning, and has amassed a collection of over 70,000 artifacts. The collection encompasses more than rail history; it touches on Americana, architectural, military, sports and Cincinnati history. Like any private collection, the general public hasn’t seen most of it – and much of it is currently inaccessible. We have begun work on the largest endeavor since the Club was founded – the Cincinnati History Preservation Project, which will accomplish two major goals: conserve and protect these valuable objects for future Cincinnatians, and digitize the collection so that it will be available to anyone with online access. We’re at a crossroads of history and technology – the Club members’ first-hand experience with the artifacts and railroading, paired with the ability to geo-tag photos, use facial recognition, sort by shape and/or color, and so on, will give users the opportunity to interact with this collection on a very personal level. That means Cincinnatians will be able to search for their family ties within the collection – whether it be related to the construction of the building or operation of the railroad, a military sendoff or reunion, taking the train to visit loved ones or even seeing a family home in the background of a construction photo. Historically, Cincinnati has gone through numerous phases of growth in the routes and transportation that join the East Side and West Side with downtown, Northern Kentucky and beyond. What started as deer, Indian, and wagon trails later evolved into our railroads and highways. Connecting with the past through the collection can be a valuable exercise in planning for the future - lessons learned from past initiatives to integrate streetcars and mass transit can be applied to current planning. This collection can serve as a rich resource for city planners and transit engineers who are working to shape the future of Cincinnati’s urban landscape. As this diverse collection gets catalogued and scanned, we will be able to connect to other historic collections - libraries, colleges, genealogy Web sites, historical societies and more. In order to keep this project moving forward, we need your help - donations, volunteers, your memories and most importantly, your feedback on the project site. We encourage you to visit www.savecincyhistory.com to browse, search and discuss – please let us know: what does saving Cincinnati history mean to you? Today the contractor that is stabilizing St Paulus Kirche removed the remnants of the tower that have been exposed to the weather for 2 years. I have no idea how 3CDC is paying for this stabilization, but I am thankful that they have taken on this important project. Unfortunately, the contractor removed the metal roof about a month ago, and it then proceeded to rain every day for 3 weeks! I would think they could have waited until May. The interior had original canvas applied to the plaster, and the ceiling had unique decorative medallions. The reuse of this structure will be very difficult and probably very expensive. But since it is the oldest extant protestant brick structure in the city (ca 1850) and is so prominent in OTR, I think it is necessary. This huge timber was vertical in the center of the tower for 160 years, and once extended up into the steeple. Even the remnant of it is huge. Someone with a big truck and more energy and space than I have should rescue some of this! See here for a 2008 post on this building. Photos from the hurricane Ike here. ...with the steps removed. A common sight around here for various reasons.. Some farmers who set up stands at the Farmer's Market part of Findlay Market are upset and threatening to leave because the prices for setup have increased. Apparently the price to sell on premium months has increased from $150 to $200, leading some vendors to think about setting up at the Party Source in Bellevue, which is apparently going to start a farmer's market. One farmer we talked to said that when he first started at Findlay Market, back when the City controlled the Market, the fee was $150 a year, and that for many years it was $50 per month. Of course back then, there were fewer farmers selling at the market. The other complaint is that the management has also made November, December and March premium months, when previously these were at a discount to attract more vendors. I am concerned, because I do think higher stall prices lead to higher prices to the consumer. ...Despite their tales of professional sacrifice, financial hardship, and declines in marital satisfaction, many parents continue to insist that their children are an essential source of happiness and fulfillment in their lives. A new study ... suggests that parents create rosy pictures of parental joy as a way to justify the huge investment that kids require. ...In an earlier time, kids actually had economic value; they worked on farms or brought home paychecks, and they didn’t cost that much. Not coincidentally, emotional relationships between parents and children were less affectionate back then. As the value of children has diminished, and the costs have escalated, the belief that parenthood is emotionally rewarding has gained currency. In that sense, the myth of parental joy is a modern psychological phenomenon. Moms of Mt Adams have started a fundraising effort to fully fund the Mt Adams pool. On March 2nd, along with many other communities, they learned that their pool was not going to open this year. They are investigating options such as self-operating the pool and leasing it from the City. This pool is a great resource for families in the area, and I hope they can keep it open. Also, the CRC has started its own donation page for the 19 community pools that are scheduled to not open this year. "Our tragic dearth of interdependencies at the local level is without dispute, and may prove to be our undoing if future circumstances conspire to reinforce just how much we really need each other"
Built to Last brings together revised versions of three of David Macaulay's classic works about architectural structures complete with updated texts, new and enhanced illustrations, and full-color artwork throughout the entire volume. 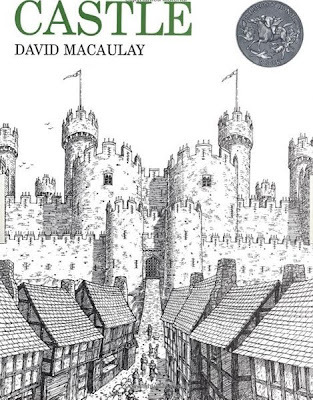 Well-known for their precise black-and-white line illustrations and intricate detail, the author's Cathedral (1973) and Castle (1977), both Caldecott Honor books, have long been staples on library and classroom shelves. Through the years, these titles have won over many a youngster with their vivid and fact-filled accounts of the planning, construction, and usage of these incredible manmade edifices. ... As Macaulay's introduction to the book states, "Understanding these buildings and the link they provide to people of another time and place should remind us that anything is buildable, whether of stone or ideas." 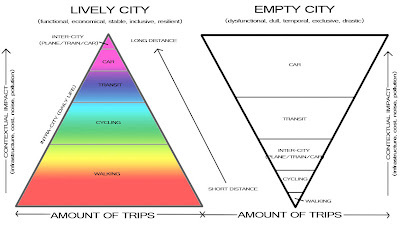 First, Steve Mouzon, the author of a blog called The Original Green has two good posts up about called automobile poverty. The first post is about the financial costs of driving, but the second post about the health of walking is even better, because he posted a picture of himself before and after he moved to a walkable neighborhood. Pretty impressive. Removal of aging highways is a strategy some cities are using to try to boost their downtown districts. In New Haven, Conn., a mistake of the past – one that displaced hundreds, razed a neighborhood, and physically divided a city – is finally set to be rectified: A highway is going to be demolished. ...cities across the United States look to erase some of the damage from urban highway construction of the 1950s and '60s – tearing up or replacing the roadways and attempting to restitch bulldozed neighborhoods. ....Two things are driving these extreme make-overs. 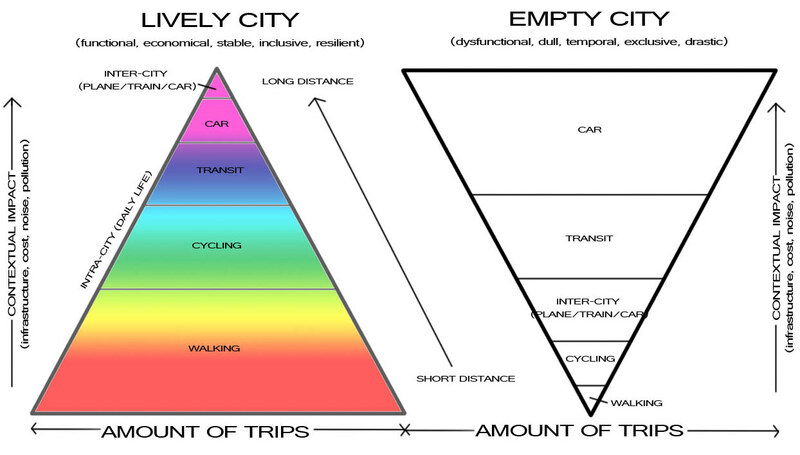 One is the simple fact that many highways built in the postwar years are nearing the end of their useful lives,... The other, is a growing faith that urban centers, including some that have been long neglected, have development potential. "There are those who give with pain little of the much that they have, and that pain is their cleansing. There are those who give with joy, and that joy is their reward. And then, there are those who give without being mindful of giving, they give just as they walk and they breathe. Through the eyes of those the heavens smile on Earth". Filmed in Kentucky and Cincinnati in 1980, this is a great made-for TV movie. There are lots of good shots of Findlay Market and different places around town, like the produce docks on the riverfront and some Clifton apartment buildings. Apparently you can watch the whole movie below. I've heard that this building may be demolished for a new development on Vine. Is that true?